Yozora is a main character in the fictional game Verum Rex, which is featured prominently in Toy Box of Kingdom Hearts III. Yozora first appears in an advertisement trailer for Verum Rex on a television viewed by Rex and Hamm in Andy's room. After Sora, Donald, and Goofy defeat a group of Heartless that appear in Andy's Room, Rex and Hamm confuse Sora for Yozora when thanking him. Yozora and his teammates are featured prominently in marketing material for Verum Rex displayed in Galaxy Toys. Yozora appears in the secret movie of Kingdom Hearts III, also called "Yozora". 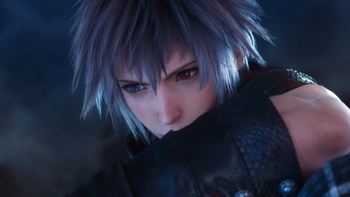 As Riku walks past a large building, Yozora sits on the edge of one of its towers and watches Riku unseen. Yozora has heterochromia iridium, with his left eye being red and his right eye being blue. Like Riku, he has short silver hair and wears similar clothes, albeit with more black colors compared to Riku's. Unlike Riku's fingerless gloves, he wears black fingered gloves. He wields a small transforming crossbow-like weapon and a sword with a glowing orange edge. Yozora's name is derived from the Japanese word for "Night Sky" (夜空, Yozora?). Yozora on the cover of Verum Rex.